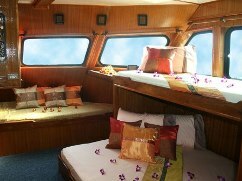 Previously called MV DiveRACE, the Andaman Tritan is a popular budget liveaboard in Singapore. The weekend trips fill up quickly. 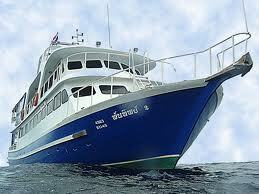 Trips dive Malaysia’s east coast islands, Pulau Tioman and Pulau Aur as well as Indonesia dive sites. The Malaysia east coast diving season is from May to October. 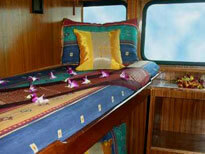 Andaman Tritan is a comfortable no frills boat. There are two master cabins on the main deck with en-suite bathrooms. The master cabins each have a double bed plus an extra single bunk. 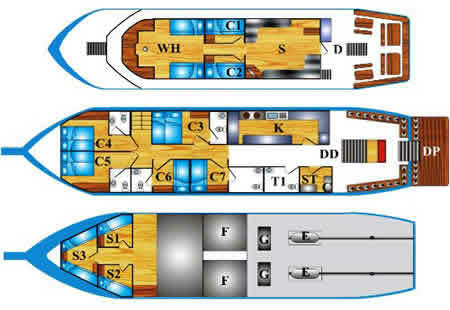 Also on the main deck are three Deluxe en-suite cabins in either twin bed or double get layout. There are 2 standard cabins on the lower deck and two on the upper deck. Standard cabins have shared bathrooms. Nitrox available at extra charge. Included in the above prices: Dive guide, tanks, weights & belt, all meals. *Note that guests are required to check if they can apply for visa on arrival (if necessary). The cost is US$10 (SGD20). Our experts will be get right back to you.